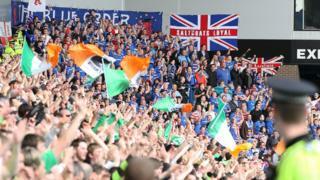 Scotland's justice secretary has said serious measures are required to tackle unacceptable conduct at football matches. Humza Yousaf said "nothing was off the table" when it came to dealing with sectarianism and violent behaviour. His comments come after a spate of incidents, where items including coins and bottles were thrown or sectarian chanting was heard during matches. A review of policing at football matches in Scotland is due this week. The review, led by South Yorkshire deputy chief constable Mark Roberts, will consider operational planning for matches, intelligence gathering and resource deployment. It comes after a series of incidents, including Saturday night's Scottish Cup match between Celtic and Hibernian where a glass bottle was thrown at Celtic forward Scott Sinclair. Last week, footage showed an object almost hitting Hearts goalkeeper Zdenek Zlamal during Wednesday's 2-1 win for Celtic. Last month Kilmarnock striker Kris Boyd criticised Celtic fans after being hit by a coin and subjected to sectarian abuse while warming up as a substitute during the sides' meeting at Rugby Park. The problem, previously termed "Scotland's shame", returned to the headlines recently after Kilmarnock manager Steve Clarke highlighted the abuse he received from Rangers fans. The club's chairman Dave King later apologised to Clarke and said everyone at Rangers "abhors the sectarian element that continues to be so prevalent in Scottish football." The Scottish government said that while the vast majority of football supporters were well-behaved, a problem remained and it was necessary for all those with an influence to enforce a zero-tolerance approach to offensive behaviour. Mr Yousaf said measures, including the idea of strict liability or restrictions imposed on clubs through local authority licensing laws, could be implemented. Under strict liability rules, a club is held responsible for the conduct of its fans. Sanctions include fines, annulment of a match result, the closure of sections of grounds or playing matches behind closed doors. Clubs are ruled by strict liability when competing in European competitions but not domestically, with Scottish Professional Football League members voting overwhelmingly against such a proposal in 2013. Humza Yousaf said: "When it comes to tackling unacceptable conduct at football, governing bodies and individual clubs must take serious measures to tackle this unacceptable behaviour. "However, it would be foolish not to also consider what additional action could be taken and we will continue to consider the full range of options, and I will listen to ideas from across the parliamentary chamber, be it Strict Liability or exploring what can be done within current licensing laws, nothing is off the table.‎"